Welcome to Yamakasa, welcome to Fukuoka! You’ve probably already spotted some loincloth-clad men running around town. These men are participants in Fukuoka’s most anticipated annual festival, Hakata Gion Yamakasa. The highlight of the festival kicks off at exactly 4:59 a.m. on July 15th when thousands of men from seven districts race through the streets carrying decorative one-ton floats. But there’s more to Yamakasa than just the main race – read our full guide to find out more, including this year’s schedule and special public transport timetable. Yamakasa can be traced back 777 years ago to a Buddhist priest named Shoichi Kokushi. In order to eradicate an epidemic, Kokushi was carried on a platform while he prayed and sprinkled holy water. The religious ceremony was held annually to keep the epidemic away, slowly evolving into the festival it is today. During the Edo era, the festival was held according to the lunar calendar during the first two weeks of June, later being changed to July. It has been held every year since except for a few brief years during the Meiji period and the world wars. Originally, the tall kazariyama, floats now used only for display, were used as the race floats. With the introduction of power lines, the floats were shortened in 1883 and again in 1910 to accommodate the electric streetcar lines. The placing of dolls of the race floats is a relatively recent practice. Following WWII, there was a shortage of materials with which to decorate the floats. Instead of dolls, a large painted piece of wood was placed on the float. Old kimono sashes made from Hakata textiles were also draped on the floats. Check out our illustrated route map with top tips on the best spots to view Oiyama, the main event! Or download and print off here. Most Fukuokans are unaware of the enormous work required to prepare for the festival. Numerous meetings and ceremonies are held at Kushida Shrine throughout the year, with the major preparation starting from the first of June. Members from each nagare begin by selecting a theme and constructing their race float with the assistance of one of the famous doll makers. Others solicit donations from individuals and companies in their area. Towards the end of June, others help with erecting tents and setting up tables in each small district. Each of the seven nagare covers a rather large area, which is then sub-divided into smaller ku or districts, thereby forming the base of an extensive hierarchy. The tents set up in each ku serve as the center of all activities for the length of the festival. Meetings and planning sessions, meals, socializing, drinking, and sometimes even sleeping take place in the close-knit, familial sphere of the tent. Come July 1, things are in full swing (see event schedule below). On this day and again on the 9th is the oshioitori, during which members of each nagare run from their home bases to the beginning of the pathway leading to Hakozaki Shrine. Here, the members purify themselves in seawater and gather sand in small baskets which they carry back and sprinkle around the entrances of their homes to purify them. Practice sessions continue until July 14, with the culmination on the morning of July 15. Each of the events serves as a warm-up to get the runners in shape and give the teams practice running smoothly and switching position while carrying the 1-ton floats. For the final Oiyama race, all teams carry their floats to the entrance of Kushida Shrine at 3:00 a.m. The first nagare begins the race at exactly 4:59 a.m., and has the honor of stopping mid-way through their swing through Kushida Shrine grounds to sing the song “Iwaimedeta”. Following that, the next six teams begin in five minute intervals. This year’s race order is: Nishi, Chiyo, Ebisu, Doi, Daikoku, Higashi, Nakasu. The frenzy of activity as a race float passes in front of you is what makes the festival so exhilarating. At any one time, only about 30 runners carry the float, while other run in front, back, or along the sides. By watching carefully the different roles being played and how the runners change positions, one can appreciate the teamwork involved. Those in the back also play an important role, acting as ato-oshi or “pushers” pushing the float from behind. 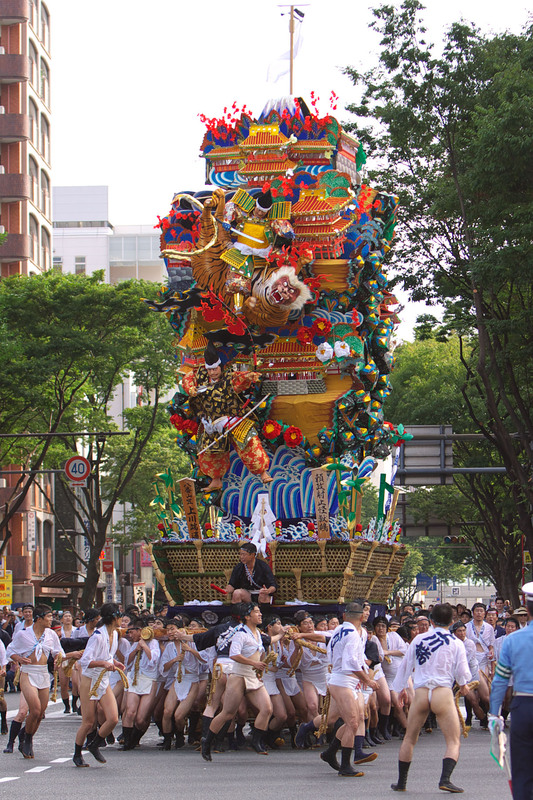 The four people riding on the float, called dai-agari, have the responsibility of directing the runners to change positions. Using a red baton (teppou) they point out individual runners who should make room for the fresh runners. If the runner doesn’t see the baton, he may get a rap on the head or shoulder. Carrying the float takes such an enormous effort that even the strongest runners do not last for more than three of four minutes at a time. Typically they will rotate in three or four times during the course of the race. Colored tenugui or headbands distinguish the ranks of the runners.The following three colors are standardized throughout the seven nagare: red designates strong, young runners with responsibility for carrying the float; red and white designates elders responsible for planning and logistics; blue and white designates elders responsible for health and safety. In addition, each nagare also has other colors to distinguish the ranks of other runners. 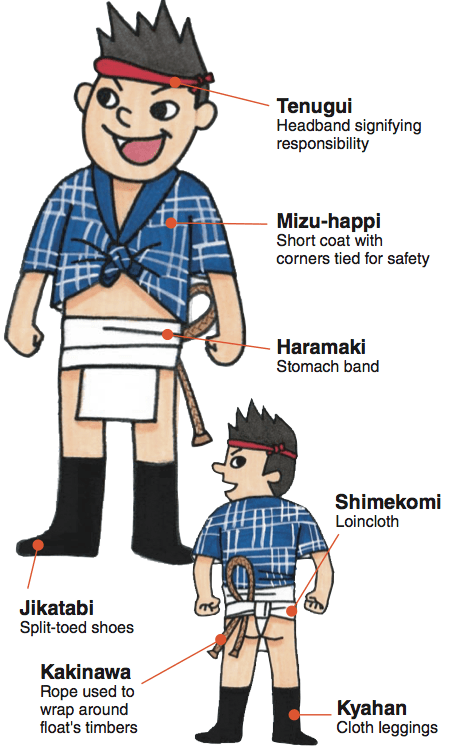 There are also four other types of runners who wear woven-colored cloth ropes around their chests to indicate their special roles: red designates the right to ride on the float; blue designates hanadori (steerers), who control the float using ropes tied to each of the four corners; green designates runners who direct traffic; yellow designates runners who clear a path for their float. They also watch out for the children, some of whom carry itamanekibata, banners with the nagare‘s name. One thing apparent throughout is the team effort required. The festival is conducted on such a massive scale that the local townspeople in each nagare must all come together for it to be successful. The importance of team spirit also comes through in the record keeping (or lack of it). Nowhere will one find published statistics on the strongest teams, team placings in previous years, course records and so on. This is not important. What is important is to participate in a cooperative, neighborly fashion, work as a team, and above all, show this effort to the gods enshrined in Kushida. A ceremony held to purify each team’s district area. A small offering of decorated bamboo and purified rope is displayed on the corner each team’s main street to pray for safety. Decorative kazariyama floats are displayed around the city. This event serves to welcome the God of Yamakasa. A priest visits each kazariyamakasa (decorated Yamakasa floats) to pray for safety. Portable kakiyama shrines are constructed and blessed. In the evening, this year’s team in charge goes to Hakozaki beach to get purifying sand (oshioi) wearing Mizuhappi. Part of the ritual of praying for safety during the festival’s events, the participants from each team run from Hakata to the beach at Hakozaki to fetch purifying sand (oshioi). On the way back they visit Japan’s great Hachiman shrines: Hakozaki-gu and Kushida Shrine, receiving sacred sake. Sand is later thrown on runners’ feet as a blessing. One of the highlights of Yamakasa Festival. The first kakiyama practice run, where teams practice carrying floats in their own districts. Each team’s course changes yearly, so to find out the route you have to ask someone in the know. Each team, operating on its own schedule, does an early morning practice run through their own territory. At this event, children are allowed to ride on the Yamakasa. Jul. 11 is the only time the teams run twice in one day. In the afternoon some teams practice running into Kushida Shrine. A rehearsal for the Oiyama race. Participants run a slightly shortened 4 km course through the streets of Hakata from Kushida Shrine. The atmosphere is similar to that of the main event, but at a more reasonable time. Floats are carried on a 2.6 km course from the Gofukumachi Intersection to the Fukuoka City Hall, where they are greeted by dignitaries. Traffic is stopped along Meiji-dori Ave. for the duration of this event. Similar to the July 10th run, some teams complete a practice run through their own territory. An evening warm-up, this is the last chance to practice and fix technique before the Oiyama. 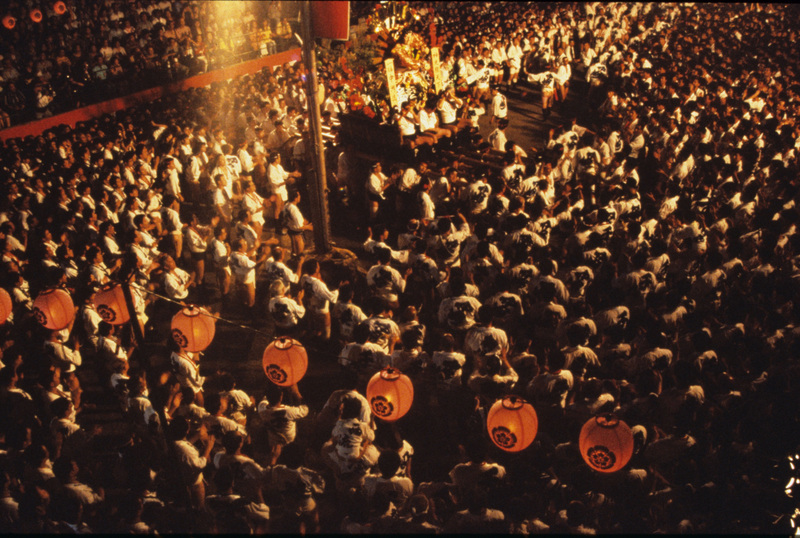 The climax of the Hakata Yamakasa festival. Teams begin assembling at 1:30 in the morning. The first team leaves the starting line at Kushida Shrine at 4:59. Thousands of men from the seven districts race through the streets carrying decorative, one-ton floats. Spectators line the streets cheering them on by shouting “oisa oisa” and splashing them with water to keep them cool. The course takes about 30 minutes to run. After the eighth team departs Kushida Shrine, a Noh farce is performed to calm the gods. Hashiru Kazariyama: Kazariyama floats are for display only, but on July 12 (at 4:35 p.m.) and July 15 (at 5:35 a.m.), the Kawabata Arcade kazariyama is Check back for our detailed kazariyama guide, coming soon! *Passengers can transfer to Hakozaki Subway Line at Kaizuka Sta. Photography: You’ll probably want to take a camera along. It will still be dark when the race begins, so keep that in mind. Also, take along some protective covering (plastic bag, jacket, etc.) to protect your camera from being splashed. Try Higashimachi-suji, the street parallel to Taihaku-dori: it slopes down toward the port, so a spot near the bottom at the intersection with Meiji-dori allows for a nice view of the floats coming from quite a distance away. Be careful, though, as the street is quite narrow! The intersection of Showa-dori and Taihaku-dori is a good place to see the floats more than once. Catch them a second time as they race down parallel streets. Gentlemen, Start Your Floats: If you want to watch the race from the starting line, stake out a spot in front of Kushida Jinja Shrine no later than 4:00 a.m. (the earlier the better). After watching three or four starts, move to another place along the route for a different view. ☛ Cucumbers: Participants are not allowed to eat cucumbers from July 1 to 14, as it is said that a cross section of a cucumber looks like the symbol of Kushida Shrine. There is also a myth that a priest of Kushida Shrine once fell and injured himself while walking through a cucumber patch. ☛ Sleeping in class: Some teachers of schools in Hakata ward allow students who participated in the Oiyama race to sleep during class. ☛ Days off: Participation in the Yamakasa Festival is a valid reason for male company employees to take days off during the festival. ☛ No nails: Each Yamakasa race float is constructed totally without the use of nails. Instead dowels, tongue and groove construction, and ropes are used. ☛ No womanizing: As a rite of purification, male participants of Yamakasa are expected to abstain from intimate contact with females. ☛ Takeda Shingen: Doll figures of Takeda Shingen, an Edo era daimyo, are never used to decorate the floats as it is thought that it will bring bad luck. At one time when a doll of Shingen was used, it supposedly brought mishaps. ☛ Food: Though not observed so strictly now, the traditional meal after finishing the Oiyama race consists of umeboshi (pickled Japanese plum), kamanboko (fish cake), asari-jiru (clam soup) and sake. Extra! Read a rundown of the festival by Jesse Kirkwood, Fukuoka Now’s reporter on the scene. Originally written in Jun. 2016, updated in Jun. 2018.